I decided the fam has been playing enough board games i needed to get a few that weren’t quite as complex as, say, Supremacy or Firefly even. We’ve got a four year old that’s pretty bright for her age, and was really engaged by Munchkin, so I looked for games with easier base games in subjects she might like. 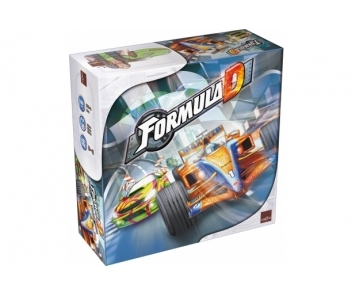 She loves cars and motorcycles, and racing, so enter Formula D — a later edition of the French Formula Dé board game by Asmodee. It’s supposedly for 10 and older, but we found the simple rules were easy enough for Sofia to grasp, and she quickly started to understand the ideas behind “slow in, fast out” and how to shift appropriately. 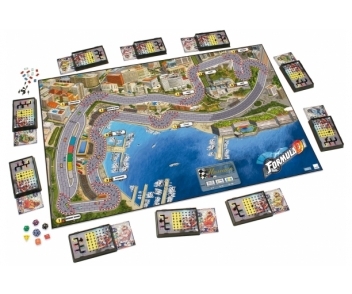 The game has two boards for the race — Monaco and a street race we haven’t tried yet. Wee toy cars are placed on the board, and each player gets a marker box with a shifter from 1-6th gear. Each gear has a corresponding die that is rolled for your speed per round: a d2 for first, d6 with 2-4 for second, d8 for third, d12 for fourth, d20 for fifth, and d30 for sixth. Your car can take a certain number of wear points. Downshift to hard, brake to hard, overshoot a turn too hard and you lose these. Take a turn far too fast, you wreck and are done. It requires some canny reading of the distances to start working the shifter to your advantage. The advanced game breaks the wear across tires, engine, etc. and there look to be characters you can play. There’s even weather rules. When the kiddo is old enough, I suspect we can start tacking on the harder stuff. Would it be more “realistic” to play each other on a gaming console? Sure, but there’s a certain fun to sitting at the kitchen table, throwing different types of dice and chatting while playing a game. It’s tactile, it’s teaching her (subtly) probabilities and how to judge distances, etc. I found a copy with no troubles at Noble Knight for $35. There’s four different expansion packs, each with two new and different tracks at $30. It’s a great example of how simple rules can still lead to complex strategizing. If you see a copy, and you’re into board games and racing games, it’s a buy.